Here’s a little story. We had gone to a nearby town for dinner and on the way back, as we passed through a burgo, a small collection of about 5 houses, we saw that 3 people were sitting on the bench right there on the edge of the road that passed through the place. Gianni, ever the connection between all things Tuscan, called out to them as we passed by and they waved to us to stop. As soon as we did, the Italian Opera began, as always, with gestures, and a half hour of stories and laughter. One of the men had broken his arm and was holding a hand carved stick which helped him do whatever he needed to do with his one good arm. By the end of the exchange Gianni walked away with his stick. How he managed to get the guy to give it to him I cannot say, but it offered me a wonderful few minutes of watching the whole drama play out. Even the nights in Tuscany are rich with possibility. 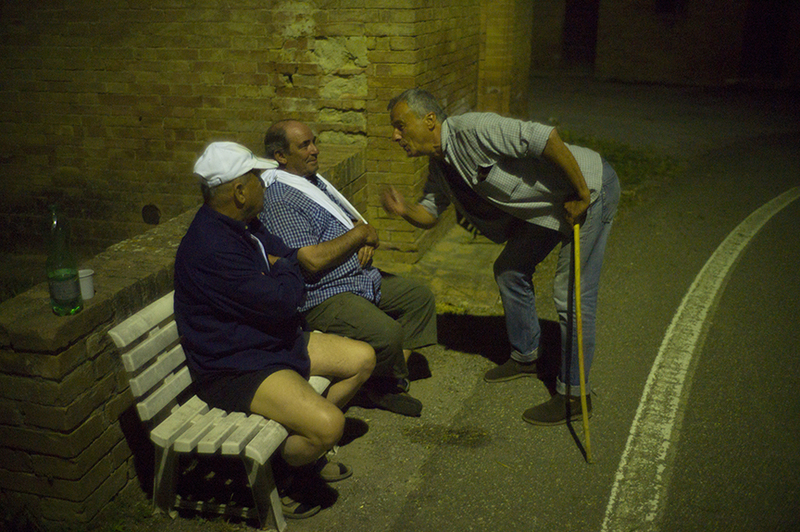 This entry was posted in Italy, Light, Night, Road and tagged Gianni, Night, Tuscany on June 22, 2015 by joelmeyerowitz2014. how many times a day in how many towns across Italy across the years has this scene played out? Timeless – and you caught it – Grazie!